Why choose this: Travelling time means to choose experiences over sights – and more than anything else – quality over quantity. Removing the rush and standing still even for a moment can reveal so much of a new destination and the culture and people within it, simply by letting your surroundings envelop around you and letting it tell you its story. Why choose this: Slow Tourism is a type of alternative tourism, a new and decelerated way of living the tourist experience, as an alternative to the "hit and run" vacation dominated by fast and frenetic rhythms where you have to visit the greatest number of places. Slow Tourism is characterized by the authenticity and the importance of emotional quality: we are looking for a unique place, through the peculiarities that identify the territory and the meeting with the inhabitants of the place. Discover Transylvania with your English speaking guide that in Romania! Day 1- Arrival at Otopeni Airport; Transfer to Bucharest at the hotel, meeting with the guide and guided tour of the city according to the time of arrival. Overnight Hotel city center 3/4 stars -20km- The tourist sites that you will visit are: Triumphal Arch, Victoriei Square, Old Town, Stavropoleos Monastery, St. Anthony's Church, Vlad Impaler's Palace, Hanul lui Manuc Restaurant, Romanian Orthodox Cathedral, Parliament Building (from outside), Calea Victoriei, Revolution Square, the Romanian Athenaeum, Royal Palace, Central University Library, the former Communist Central Comitee. Welcome dinner and overnight at hotel in Bucharest. Departure for the town of Curtea de Arges, with an ancient history that continues to live thanks to its buildings of the fourteenth century. In addition to the visit of the Monastery of Curtea de Arges built on the orders of the Holy Prince Neagoe Basarab, the Princely Church of St. Nicholas is also worth a visit, decorated with beautiful frescoes from 1350. The monastery, however, is famous above all for its legend, built in Byzantine style between 1512 and 1517 and declared a World Heritage Site by UNESCO. Surmounted by two spiral towers and a dome, the central body of the monastery is flanked by a second block surmounted in turn by a dome, higher and wider than the central one.We continue to discover the Valley of the river Olt (the fourth longest in the country) and the Cozia Monastery where, going down the steps you can admire the river, and raising your eyes, the majesty of the Carpathian mountains. You arrive in the evening in Sibiel. Dinner and overnight at the farmhouse. Breakfast and visit of Sibiu, one of the largest cities in Transylvania designated a few years ago as a European cultural capital. Depending on the time you take a guided tour of the historic center in the afternoon or the morning of the following day. As major tourist attractions, you can admire the Baroque-style Bruckenthal Palace, the Bridge of the Lies, the Orthodox Christian Cathedral, home to Transylvania Mitropoly, the Saxon Cathedral, the Catholic Cathedral and the Council Tower.In the afternoon, visit of Astra Sibiu National Museum. 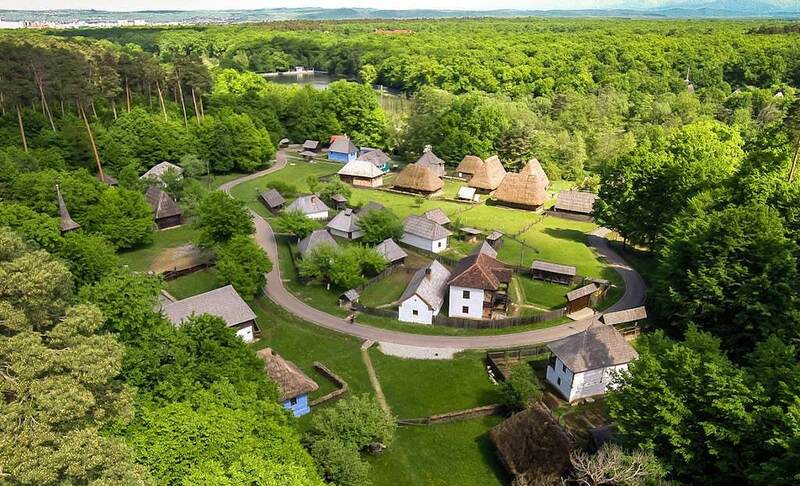 With its 96 hectares, it is the largest open-air ethnographic museum in Romania, if not in all of Europe. Set in a shady park, it boasts about 350 buildings, perfectly reconstructed in style, which illustrate the technical heritage of the country. Stroll through wind and water mills, workshops, forges and craftsmen's houses, admire the wooden church of Dreata, called the "Sistine Chapel of Transylvania" for the wall paintings that illustrate the Bible. Traditional dinner in Sibiel and overnight. In the morning departure to arrive at the Fortress of Biertan, included in the Unesco World Heritage. The fortified church of Biertan is a true jewel of Saxon architecture. Three city walls surround the Protestant church that stands on top of a hill. The prison is interesting: here they were locked up in the same cell and kept to the bread and water the spouses who wanted to separate until the reconciliation took place. Beautiful the Door of the Sacristy in carved wood and with a special lock.Continue towards Sighisoara, The city is known as "The Pearl of Transylvania". A window on medieval life, a romantic village made of narrow streets and houses with narrow streets and typical houses of the era that make us retrace the history of a country rich in culture and traditions. We will see the Clock Tower, the house of the famous Vlad the Impaler called Dracula, in about 1431 and the steps leading to the most panoramic point of this village. 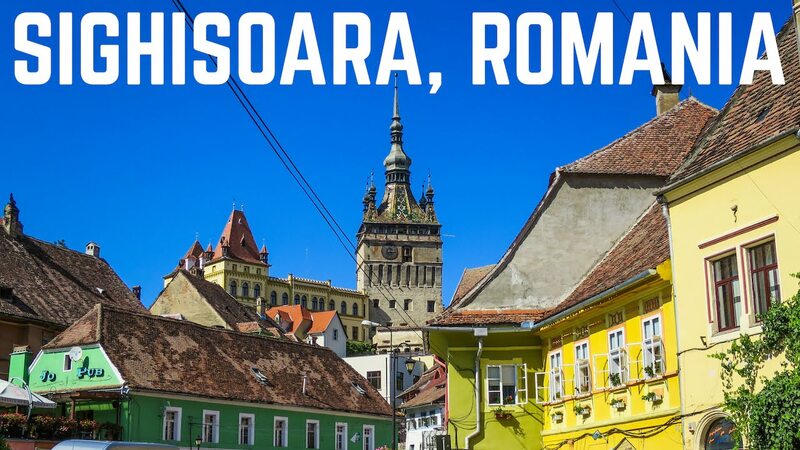 Dinner and overnight stay in the city center of Sighisoara. After breakfast we will visit the Saxon village Viscri or Weissekhirche (in English "the white church") included in the UNESCO World Heritage Site in 1999, and appeared on the world map of traditional villages. How did you become famous Viscri? This island of the Saxons was formed in the twelfth century, when they were brought here by order of the King of Hungary to defend Transylvania against the invaders. The tour continues, you visit the Fortress of Prejmer (UNESCO World Heritage) and then you arrival at Brasov, one of the most beautiful multicultural cities of our country, located in Transylvania. You can see the Council Square, the Council Tower, the Black Church, the Catherine Tower, the Black and White Tower and the ancient area of ​​the city called Schei, where the Romanians lived from long ago. Dinner and overnight in Brasov. Arrival at the famous Bran Castle, known as Dracula's Castle, after Bram Stocker created the legend of Count Dracula. In reality the castle was built by the Saxons as a guard post to defend and control the trade route that connected the Transylvanian and Valachian regions in the Middle Ages. The term Bran means "border". The place is linked to the legendary prince Vlad the Impaler who fought a series of fights in the area during the fifteenth century. In our country the castle is known as the summer residence for Queen Mary who came here often, far from court life in Bucharest.Then we visit the Rasnov Fortress, one of the best preserved Saxon fortresses in Transylvania, built to defend and control the trade route that connected the Transylvanian and Valachian regions. From here you can admire a beautiful panorama with the surroundings of Rasnov and Brasov. Alternatively, you can visit the Prejmer Fortress, founded by the Order of Teutonic Knights and included in the UNESCO World Heritage. In the afternoon we continue the visit of Brasov, we'll get back some free time, dinner and overnight. After breakfast, departure for Sinaia, a famous town in Romania for its natural and tourist beauties. 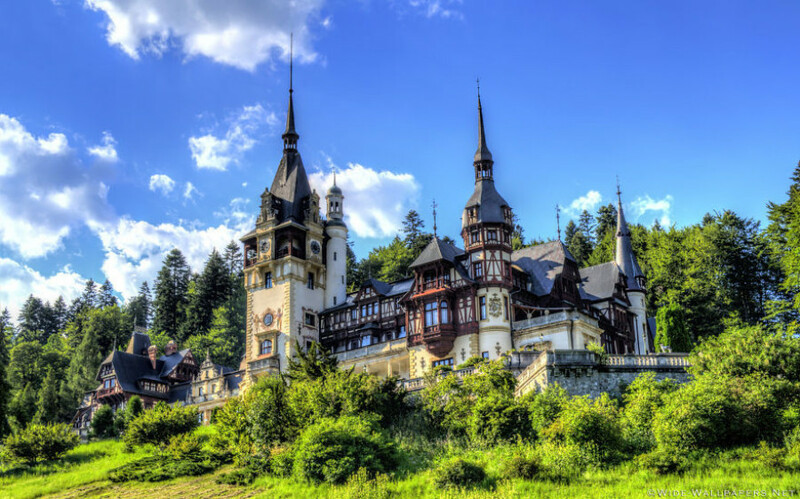 The Castle of Peles, summer residence of the royal families of Carol I, Ferdinand, Carol II and Michele is one of the most beautiful castles in Europe. It was built on the order of Carol I, owes its particularity to the architectural style that combines various elements: gothic, baroque, traditional romanian, art nouveau and others, so the castle could be considered a lezzione in the history of art.Continue to the monastery of Sinaia which has existed since the end of the seventeenth century, being in the forests of the Carpathian mountains. The Romanian-style construction "brancovenesc" was made by the Mihail Cantacuzino in 1695. Light trekking to visit the Urlatoarea Waterfall of Busteni (optional). Alternatively, visit the Cantacuzino Castle of Busteni. Dinner and overnight in Sinaia. After breakfast, according to the departure flight, we visit The Snagov Monastery, where it is said that Vlad the Impaler (the son of Vlad Dracul) was buried. The monastery was built strategically in the middle of Lake Snagov, on the island of the same name. Inside is the largest medieval wall painting in a Romanian church, built in the 16th century. Non-Stop Assistance SOCA TOUR Romania. LOW COST service discount (accommodation in holiday farmhouses, in touristic locations or apartments, without food): 210 EUR / person. For agency groups, send us an email at contact@socatour.ro. See here the TOURIST STRUCTURES we work with. Click here.